d e a n f o r b e S w a l k i n g , n o t r u n n i n g . . . I am intrigued by the challenges facing universities, and try to bring together my two main interests: international education and community engagement. Internationalisation in universities is about “engaging students, staff and the University community in an array of international activities both on campus and abroad, forming partnerships and expanding the international activities and profile of the University, developing the knowledge required for living in an interdependent world, and contributing to global understanding”. Community engagement is about “a new social contract between society and the university is moving the idea of engagement from its traditional association with outreach into the very conduct of its research and teaching...The new contract autonomy can be sustained only to the extent that universities become engaged in the joint production of knowledge with their communities” (Gibbons 2005). Many universities are re-inventing and expanding their international education programs. In parallel, community engagement in universities is developing in exciting ways, with some provocative re-shaping of agendas. We will continue to see innovation in the way universities engage with their local and international communities. Both processes are driving changes in the ways that universities function, and are managed, and have significant implications for the future of universities. The project on Universities and the Creation of the Modern Knowledge City explores how universities change or influence cities, or are ignored by them. About what they expect of each other, and whether they have a shared understanding of the shape, purpose and potential of knowledge to the economy and society. It explores how the collaboration of cities and universities might enhance the regional and international competitiveness of cities and of universities. I want to understand what this means for the future of universities and satellite institutions such as think tanks and tertiary colleges. In the second half of 2013 I was located in the Woodrow Wilson Center in Washington DC working on the project. Progress is outlined in the paper titled “City and University Strategies for Competing in the Global Knowledge Economy”. 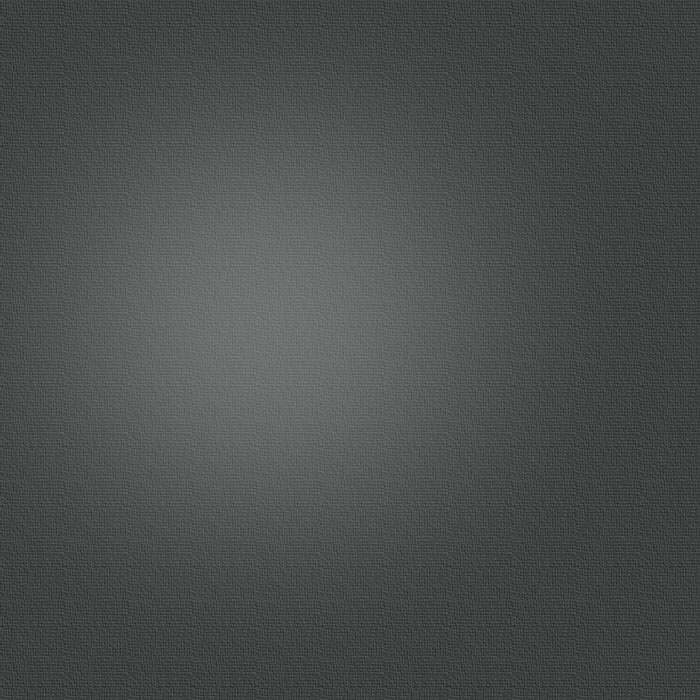 ‘The fading of a ‘university city’ vision.’ APPS Policy Forum, 10 March 2015. ‘International University Campuses and the Knowledge Economy: The University City Project in Adelaide’ Global Policy, Vol 5, Issue 4, 2014, pp 485-493. ‘Vietnamese knowledge economy growth will be gradual‘ Oxford Analytica Daily Brief, 14 November 2014. ‘Reversing Malaysia’s ‘brain drain’ will take time’ Oxford Analytica Daily Brief, 17 June 2014. ‘Singapore's “global schoolhouse” plan faces challenges‘ Oxford Analytica Daily Brief, 3 January 2014. “Australia’s knowledge cities: work in progress” Australian Higher Education Congress 2009. With Cecile Cutler “The global knowledge economy, the university and the Southeast Asian city” in Wong Tai Chee and Brian Shaw (eds) Challenging Sustainability: Urban Development and Change in Southeast Asia (Marshall Cavendish Academic, Singapore, 2006, pp 175-196). 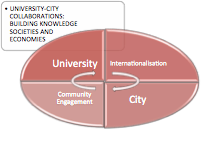 “Creating education cities in the new global knowledge economy” South Australian Policy Online. Conference on Learning Cities in 2005. “Cities, universities and global competitiveness”. Institute of Australian Geographers Conference, 2004. A student seminar on “Asia and the global knowledge economy”. I am a member of the Editorial Board of the International Journal of Knowledge-Based Development (Inderscience). In conjunction, I have been a member of the International Scientific Committee for Knowledge City World Summits (KCWS) in Melbourne (2010), Matera (2012) and Istanbul (2013). The most recent KCWS was at Tallinn University in Tallinn, Estonia, in September 2014. The Cities of Memory and Meaning project records my experience of a city at a particular moment. I write from a personal viewpoint, shaped by observation, artifacts and memory. The narrative is infused with the ideas and distractions acquired from books, essays and blogs on cities. Stories about cities told through the scholarly and fictional exploration of people and places. My story explores memories of Australian and Asian-Pacific cities in the past, and how they influenced my life, and what they say about the feel and the soul of the city. I am currently creating a text accompanied by a series of collages that come together in Artist’s Book on Papua New Guinea and Vietnam in the early 1970s. It is about Port Moresby and the coastal and highland towns where I visited with students or undertook research. ‘China’s cities: Reflecting on the last 25 years’ (a revised version of a conference presentation) is in Sustainable Development in China, edited by Curtis Andressen, Mubarak A.R. and Wang Xiaoyi (Routledge, London, 2013, pp 39-46). ‘Getting by in Indonesia: Research in a foreign land’ is in a book edited by John Eyles titled Research in Human Geography: Introductions and Investigations (Basil Blackwell, London, 1988, pp 100-120). Townske. Uncover Cities Through People You Like. Stephen Hamnett and I co-edited a book on contemporary Asian Pacific megacities. 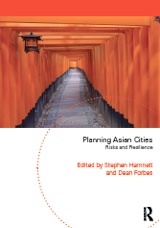 The title is Planning Asian Cities: Risks and Resilience. It was published by Routledge in May 2011. It is also available as an eBook. Routledge published a paperback version (with a different cover) in 2013. Stephen and I worked together a few years ago on a special issue of Built Environment which was titled “Pacific Asian Cities: Challenges and Prospects”. Around 924 million people, according to UN Habitat 2003 estimates, live in urban slums and squatter settlements. Over half of these people are in Asia. Self-help squatter settlement improvement programs have been around since at least the beginning of the 20th Century, but they attracted the support of major international institutions from the early 1970s. So why, over 40 years later, are there still so many people living in slums and squatter settlements, and why are conditions within them so appalling? I was a chief investigator for a project on Strengthening urban slum upgrading and urban governance in Southeast Asian cities. 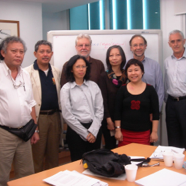 It received Australian Research Council funding for 2005-2008, through the efforts of the late Dr Basil van Horen. John Minnery took on the role of co-ordinator after Basil’s passing. The project sought to understand what works and what doesn’t work in slum improvement programs, and what institutional structures can be put in place to improve success. The project focuses on slums in three cities: Bandung, Hanoi and Manila/Quezon City.